In this article we will explore two platforms: Spark for Wi-Fi and TI Sensor Tag for BLE with practical examples. At any time, you can also look at the complete annotated code for each example. It will be fun! Wiring pattern in a breadboard. You will get this cable when you buy the Spark Core or this might be your mobile charger. Tip: Use the same color wires as the schematic so that it will be faster to trace the wires for debugging. E.g. use Red for power and Black for ground. Tip: LDR has no polarity, so either leg can be connected to the analog pin or the ground. Tip: Resistor has no polarity, so either leg can be connected to the analog pin or the ground. Tip: The capacitor used in this example has polarity. On the plastic above one of the pins you’ll see a light colored strip with a negative sign – on it. Always connect that pin to GND pins or rails. In this section, we will connect the Spark Core to your Spark account and then connect it to the local Wi-Fi. To setup the Spark Core, signup for an account. Then connect the Spark Core to your laptop via the USB cable. You should see a fast-paced blinking blue light which means the Spark Core is waiting for Wi-Fi credentials. To associate the Spark Core with your account (also known as “claiming the core”), we will use the spark-cli module. Next, we will give the Spark Core our local Wi-Fi credentials so it can connect to the Wi-Fi network. If you have setup the Spark Core correctly, you will see a breathing cyan light as shown below. Next, we will note down two important values (device id and access token) for your Spark Core that will be needed for any secure communication. Open Spark’s web editor, Spark Build for this and note down these 2 values. Blink the on-board D7 LED. As the very first step, we will learn how to blink an LED. This is the hello world of electronics. Open the Spark web editor and copy the simple blinking LED code. Here it uses a simple firmware code to blink the on-board LED D7 every 1 second. To flash the firmware code onto your Spark Core, click the flash icon at the top of the left sidebar and wait for the LED on board to come back to the breathing cyan pattern. You should see the LED D7 blinking. Wire up the breadboard for detecting photocell values. Here we will need a couple of jumper wires, one photocell and 1kΩ resistor. We will firstly wireup the Red wire to pin Vin and the horizontal lines +. And similarly, the Black wire to pin Gnd and the horizontal line -. Next we will connect the photocell (or LDR) to pin A0 on the Spark Core and the ground, horizontal line -. LDRs do not have any polarity, so we can connect either of the legs to Gnd. Finally, with the 1kΩ resistor, we will connect to pins A0 and Vin on the Spark Core. This circuit might remind you of your high school physics voltage divider circuit. While you see the breathing cyan on the Spark Core, take the LDR firmware code and flash it onto the Spark Core with the web ide. The firmware code does a couple of things. Every 200ms, it take the analog reading from pin A0, to which we connected the LDR and then publishes it as a Variable on the Spark Cloud which can then be queried using standard Web APIs. For easy detection and debugging we are also turning on and off the on-board LED D7 to indicate our code is running. Let’s wire up the breadboard with a servo this time! We will use a servo motor and a capacitor. Wire up the Black / Brown wire to the Gnd pin of the Spark Core, Orange / Red to the Vin of the Spark Core and finally the Yellow wire will be used to wire up to the analog pin A0 of the Spark Core. We will also use a capacitor between the Vin of the Spark Core and Gnd of the Spark Core to stabilize the power to the servo. Capacitor is optional, but it’s good to have it for stability. The control of the servo is fairly easy. It can rotate 180 degrees. So, when the signal is 0V, it will rotate to 0 degrees and at the other end, when the signal is 5V it will rotate to 180 degrees. To help us do the analog output of these signals, we will use a firmware called VoodooSpark. VoodooSpark will allow a local TCP connection instead of the usual HTTP protocol that we used in the earlier example. This allows controlling the Spark Core in real-time. Finally, we will use Express to create the routes that will trigger the rotation of the servo through an html page. We will need 3 modules. 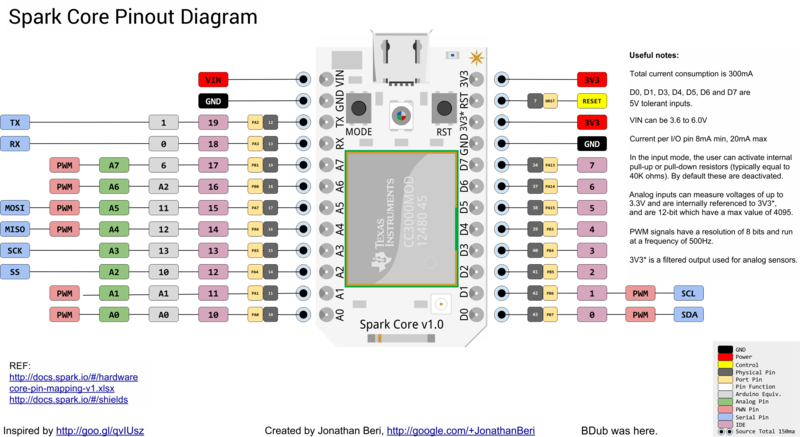 Spark-io to output the TCP packets which VooDooSpark firmware on the Spark Core understands. Johnny-Five package uses Spark-io and provides higher level interfaces to many devices such as sensors, motors, switches, etc. And finally Express to serve a webpage and pass HTTP requests from the browser to the Spark Core. Store the Spark device id and access token in config file. Finally we will create the super simple html page index.html which will call the routes for the different angles. Run the code with the node server and click the angles to make the servo move in the physical world! This example is just the tip of the iceberg in how you can control many other devices such as motors and switch with the web interface. I find the Johnny-Five library files very useful to peek into many more things we can hook up and play with! In this section, we will use the Bluetooth Low Energy (BLE) protocol with the TI SensorTag, which is designed for developers to play with various sensors and BLE. The SensorTag comes with a BLE chip on-board along with sensors such as IR temperature sensor, humidity sensor, pressure sensor, accelerometer, etc in a compact handy device. The advantage of using BLE is its low power consumption. The SensorTag can be powered with just a coin cell potentially for years. The main npm module that we will be using to interface with the SensorTag is senstortag which is based on an underlying generic node BLE central module, noble. We will attempt to read the IR temperature from the SensorTag and log the gyroscope data while rotating the sensortag. Let’s get started by requiring the modules and connecting to the sensortag. Because the events connect, discovered and disconnected should happen sequentially when the previous event is done, we will use the npm module async to deal with callbacks. You can refer to the entire code here. Let’s run it! That is just a tiny example on how to interface with a BLE device. To dabble more, have a look at all the sensors data you can query in the SensorTag as well as the underlying noble module. The author of both these modules, Sandeep Mistry has open sourced many more BLE related npm packages such as the ones we can interface with iBeacons or Arduino library. Have a go at them! Shurthi, NodeBoats workshop facilitator at JS Conf Asia 2014, tracking a participant’s boat controlled with Spark Core, VoodooSpark, Spark-io and Johnny Five. I hope this article gave you not only the initial steps for getting started, but plenty of resource to hack on your own or even get involved with the community! It might be challenging at start, but seeing your code literally come to life in the physical world will be immensely rewarding. Published on 22 April 2015 in Articles. Edit this article on GitHub. Licensed under a Creative Commons Attribution 3.0 Unported license.